Purpose: Presence of functional tooth units is essential for preserving masticatory function among individuals. Representing the essence of health promotion practice, demand to measure varied evaluation outcomes is highlighted. Aim and Objectives:(1) To assess the influence of occlusal support and perceived chewing ability on oral health-related quality of life (OHRQoL) among adults attending a private dental institution in Mangalore. (2) To evaluate occlusal support using Eichner index (EI), perceived chewing ability using a self-administered questionnaire and OHRQoL using Oral Health Impact Profile-14 (OHIP-14). Materials and Methods: Overall, 300 adults attending a private dental institution in Mangalore were included. EI was used to group participants into three groups. The chewing ability was assessed using a questionnaire on perceived difficulty while chewing eight common foods. OHRQoL was measured employing OHIP-14. Perceived general and oral health status and demographic information were collected. Results: The mean perceived chewing ability score was 12.98 ± 6.2 and the mean total OHIP score was 9.23 ± 8.9. EI showed a significant relation with perceived chewing ability, OHIP, and perceived general health status (P < 0.05). Perceived chewing ability and OHIP demonstrated a significant correlation (r = 0.31, P< 0.001). Age, gender, education, occupation, monthly income, family income, and number of family members demonstrated a significant association with EI (P < 0.05). Binary logistic regression analysis revealed that EI, perceived chewing ability, and perceived oral health emerged as significant predictors of OHRQoL (P < 0.05). Conclusions: Occlusal support was significantly associated with perceived chewing ability, OHRQoL, and perceived general health status. The restoration of chewing function is one of the foremost goals of oral healthcare services. However, the maintenance of chewing ability is a challenging task for patients with partial or completely edentulous arches. The reduction in chewing ability is a commonly observed consequence of tooth loss., The objective chewing capacity can be partially restored by oral rehabilitation, which might result in an increased chewing ability. There is a demand to measure diverse evaluation outcomes that signify the essence of health promotion practice. An index that has been put forth for the assessment of occlusal condition is Eichner index (EI), which is based on the presence of natural occlusal contact in the premolar and molar regions. These regions are divided into four supporting zones, two in the molar and two in the premolar regions. Based on the intermaxillary tooth contact in these four zones, a patient is thus classified as belonging to one of the three groups. These groups represent the course of tooth loss and record the functional value of the natural dentition. Thus, this classification provides a standard for the degree of morbidity of the dentition and is suitable for application in studies on morbidity statistics. Tooth loss has a direct impact on an individual's ability to chew food, which is an essential component of general health status. The chewing ability affects the nutritional intake and dietary choices, which in turn have a significant influence on general health. The chewing ability results in health benefits of an array of foodstuffs while improving the pleasure and satisfaction of meals., The chewing function is assessed by chewing tests, questionnaires, or personal interviews. The chewing tests assess masticatory efficiency objectively, and questionnaires provide information about the perception of chewing ability of an individual. The patient-reported outcomes have received considerable attention in recent years. Therefore, the patient-reported assessment approach has become noteworthy for the assessment of chewing ability. Loss of teeth and the accompanying difficulties in chewing food can influence the quality of life of an individual. Oral health is thus an integral and inseparable part of overall health. Oral health affects general health in a variety of ways such as affecting dietary choices, speech and quality of life and well-being of individuals, besides causing pain and suffering. Further, the consequences of compromised dental function can be swallowing of poorly chewed food, food avoidance patterns, dietary inadequacies, reduced vigor, debilitation, and shortened life expectancy. The subjective evaluation of oral health-related quality of life (OHRQoL) “reflects people's comfort when eating, sleeping, and engaging in social interaction; their self-esteem; and their satisfaction with respect to their oral health.” The Oral Health Impact Profile (OHIP) was developed by Slade and Spencer  as one of the tools for evaluating OHRQoL, which was later modified as the shortened version of the OHIP and validated (OHIP-14). The chewing problems lead to diminished perceived oral health, which in turn results in treatment demand in most cases. It is thus required to determine the relationship of OHRQoL with perceived chewing ability in adults and the elderly. It has been observed that a shortened dental arch (SDA) comprising anterior and premolar tooth achieves the requirements of a functional dentition. Moreover, treatment with removable partial dentures enhanced masticatory function, patient satisfaction, and OHRQoL. There were no clinically significant differences between subjects with SDA of three to five occlusal units and complete dental arches regarding variables such as masticatory ability and oral comfort. The SDA as a treatment option is encouraging in terms of functioning, patient satisfaction, and cost-effectiveness. The purpose of the present study was to ascertain the relationship between natural occlusal supports evaluated by the EI and perceived chewing ability, along with OHRQoL among adults attending a private dental institution in Mangalore. It is the first study to explore EI among Indian population and the first study to investigate all the above three parameters simultaneously. The study was therefore conceptualized keeping in mind the significant implications for OHRQoL and edentulousness in Indian population. The present study was carried out among a purposive sample of general dental patients who reported to a private dental institution (Manipal College of Dental Sciences, Mangalore). The ethical clearance was obtained from the Institutional Ethics Committee (protocol reference number 14023). Informed consent was obtained from all participants included in the study. A cross-sectional study was conducted from March 2014 to August 2014, based on clinical examination and a questionnaire. A pilot survey was conducted among 30 adults, and the results from this pilot study were used to calculate the sample size (n = 300) for the main study. Considering the standard deviation of OHIP-14 scores (5.21) in the pilot study, the permissible error to be 5%, and 95% confidence interval, the sample size was estimated to be 300. The inclusion criteria were specified as adults aged above 35 years attending a private dental institution in Mangalore and those who provided written informed consent to participate in the study. Participants who have undergone or are undergoing treatment for any systemic disease or condition and differently abled individuals were excluded from the study. Occlusal support was assessed by using EI, which was recorded according to the Eichner classification. In this classification, each posterior contact area, including both the premolar and molar regions, is counted as one zone, yielding a total of four supporting zones. Group C: No occlusal contact at all. Group C3: Fully edentulous in both arches. The individuals were thus divided into three Groups A, B, and C depending on the Eichner group classification. Oral examinations were performed to record EI by a single trained and calibrated examiner. The examinations were done with the participants seated on the dental chair. The number and distribution of occlusal supports was analyzed by an experienced prosthodontist (Umesh Y. Pai) who was familiar with the index and the prosthesis provided. Perceived general and oral health status. The perceived chewing ability was assessed by means of a self-administered questionnaire. The questionnaire elicited information regarding the ability of the subject to chew eight different common local Indian foods, including four hard and four soft foods. Perceived difficulty of chewing was scored as follows: 1 = very easy to chew; 2 = minor problems with chewing, got used to it; 3 = minor problems, cannot get used to it; 4 = difficult to chew, not avoiding this food; 5 = very difficult to chew, not avoiding; 6 = very difficult to chew, avoiding this food; 7 = not avoiding this food, never eating it. The questionnaire was translated into the local language and administered to 35 study subjects before the start of the study. The Kannada version was checked for language adequacy and validity by a panel of dentists, and some minor modifications were made based on the results of the pilot study. Reliability of the questionnaire was assessed by employing Cronbach's alpha (0.8). A 14-item version of the OHIP-14 that has been previously validated in the same population was employed to measure OHRQoL. This instrument characterizes the following seven domains related to oral health which influence an individuals' quality of life in the past 12 months: Functional limitation, physical pain, psychological discomfort, physical disability, psychological disability, social disability, and physically challenged. A 5-point Likert scale was employed to record the responses. The response format of OHIP-14 was as follows: Very often = 4, fairly often = 3, occasionally = 2, hardly ever = 1, and never = 0, with scores ranging from 0 to 56. The pilot study revealed an internal consistency reliability of 0.87, which was acceptable. Perceived general and oral health status were assessed employing a 5-point Likert scale.,, Demographic details such as age, education, occupation, monthly income, monthly family income, marital status, religion, dietary pattern, and family size were also collected by a self-administered questionnaire. The Statistical Package for Social Sciences, version 16 (SPSS Inc., Chicago, IL, USA), was used to analyze the data. The level of significance was fixed at 95% level (P < 0.05). Chi-square analysis was used to evaluate the association between the EI and the demographic variables. Associations of perceived chewing ability with demographic variables were analyzed using Chi-squared test, t-test, and ANOVA. Pearson correlation coefficient was calculated to assess the correlation between OHIP-14 and perceived chewing ability. A binary logistic regression analysis was performed to test each explanatory variable's relationship with the outcome variable OHRQoL as measured by OHIP-14 after controlling for the other factors. All the participants were above 35 years old with equal number of male and female participants. The mean age of the participants was 51.77 ± 12.4 years and mean age in Eichner Groups A, B, and C were 45.17 ± 9.4, 48.86 ± 9.9, and 61.28 ± 11.4 years, respectively [Table 1]. Then mean perceived chewing ability score was 12.98 ± 6.2, and the mean total OHIP score was 9.23 ± 8.9. The mean perceived chewing ability score was higher in Eichner Group C (17.00 ± 7) followed by Eichner Group B (11.88 ± 4.2) and A (10.06 ± 4.2), indicating perceived difficulty in chewing to be greater in Eichner Group C. OHIP-14 scores were lower in Eichner Group A (6.76 ± 7.3) than Eichner Group B (10.14 ± 9.9) and Eichner Group C (10.81 ± 8.8), indicating a better OHRQoL among the study subjects belonging to Eichner Group A. EI displayed significant association with the sociodemographic variables such as age, gender, education, occupation, monthly income, monthly family income, and number of family members (P < 0.05). Perceived chewing ability was significantly associated with age, gender, marital status, religion, education, occupation, and monthly income (P < 0.05). OHRQoL revealed a significant association with monthly income (P < 0.05). Perceived general health status was found to be significantly associated with only with the number of family members (P < 0.05) [Table 2]. EI was significantly associated with perceived chewing ability and OHRQoL (P < 0.05). While no significant association was noted between EI and perceived oral health status, a significant association was seen between EI and perceived general health status (P < 0.05). 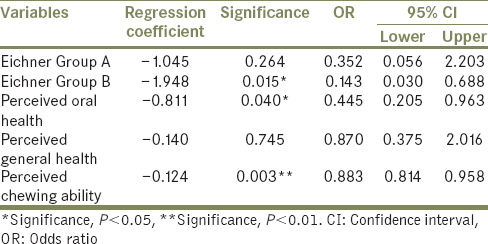 OHIP-14 and perceived chewing ability were positively correlated (r = 0.31, P < 0.001), thus indicating that a better chewing ability was related to a better OHRQoL [Table 3]. Perceived chewing ability was significantly associated with perceived oral health status (P < 0.05), but not with perceived general health status. OHRQoL revealed significant associations with perceived oral health status and perceived general health status (P < 0.05). Moreover, perceived oral health status and perceived general health status were also significantly associated (P < 0.05) [Table 3]. 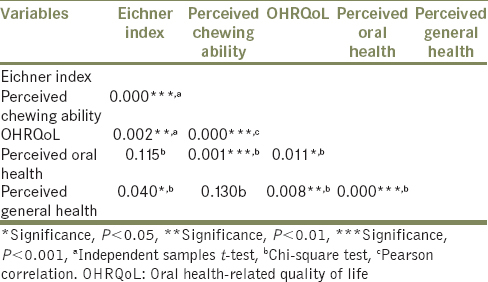 Binary logistic regression analysis revealed that EI, perceived chewing ability, and perceived oral health emerged as significant predictors of OHRQoL (P < 0.05) [Table 4]. The present study characterizes the relationship between natural occlusal supports as assessed by the EI, perceived chewing ability, and OHRQoL among adults attending a private dental institution in Mangalore, Karnataka, India. The present study is the first to report on EI in India. Also, there are no studies reported in the literature which explored EI, perceived chewing ability along with OHRQoL simultaneously in a single population. The study highlights important demographic factors that influence occlusal support, OHRQoL, and related factors among the study participants. Occlusal supports as assessed by EI have an influence on perceived chewing ability of an individual and ultimately on OHRQoL. Perceived general health and perceived oral health status were significantly related to their OHRQoL. Lower OHIP-14 scores were associated with lower chewing function scores in the present study, reflecting that poor perception of chewing ability was associated with poor OHRQoL. A similar correlation was reported by Inukai et al., who observed a significant relationship between perceived chewing ability and OHRQoL in partially dentate patients visiting a prosthodontic clinic. This relationship was influenced by denture status and demographic characteristics. Brennan et al. observed a positive relationship between the number of functional tooth units and the chewing ability in a population-based sample. The avoidance of tooth loss was associated with a better ability to chew food, thus a significant association between chewing ability and OHRQoL was observed which is similar to the results obtained in the present study. Nguyen et al. also showed a significant association between chewing ability, assessed by the measurement of problems with chewing hard and soft foods, and OHRQoL in subjects from rural and urban areas. The present study is in agreement with a previous study by Ikebe et al., which revealed that masticatory performance significantly decreased with a reduction in occlusal contact. Kimura et al. observed a higher satisfaction with oral condition in individuals with a better occlusal support. The evaluation of occlusal support was beneficial in elderly people as an indicator of health and oral function. Earlier investigations ,,, have revealed that gender did not have any effect on masticatory performance, whereas Nguyen et al. observed that females reported more complaints with chewing hard foods. However, the present study revealed that gender was significantly associated with perceived chewing ability, with females demonstrating a better chewing ability. The social and cultural differences in the perception and reporting of chewing function may explain the current finding. Traditionally, the Indian females are more adaptable and less complaining. Ikebe et al. concluded that as the age of the subjects increased, the masticatory performance decreased. This is similar to the results obtained from the present study, where the subjects reported greater perceived difficulty in chewing foods with increasing age. On the other hand, findings are different from a study conducted by Ikebe et al., where age was not significantly associated with dissatisfaction with masticatory function. In the present study, the individuals with a high income were more likely to have a better quality of life than their low-income counterparts. The argument suggests that the lower the people's income or social status, the higher they will be engaged in health-damaging activities, along with a higher prevalence of health risk behaviors such as smoking, alcoholism, sedentary lifestyles, and unhealthy diets. The finding that perceived general health status was significantly higher with less number of family members might be explained by the fact that people with a small family have a better access to services, quality medical care, and nutritious food. Poor and unsafe living environments environment in such conditions result in higher emotional stress and therefore lead to illness, mental, and psychological problems, eventually leading to a poor perceived general health status. In the present study, EI and perceived chewing ability were significantly related to the educational status of participants, similar to a study by Nagaraj et al., where an association was seen between edentulism and educational level. The association of EI with perceived general health status reiterates the finding that occlusal supports have a significant effect on the general health status of the individuals, affecting their food choices and consequently their dietary intake. Interestingly, subjects belonging to Eichner Group C without natural posterior occlusal contacts reported an OHRQoL comparable to subjects in Eichner Group B. An explanation for this could be that patients' satisfaction with chewing function is determined by their earlier experience and expectations regarding dentures. As the complete denture wearers have a longer denture-wearing experience, they might have adapted their diet to complete dentures. Moreover, the patients who have poor masticatory performance may prefer food that is easily chewed, or choose to prepare the food in an easily chewable form by cooking it for a longer time or by chopping it into smaller portions. Many age-related medical problems and diseases also have an influence on their dietary selection. The present study has to be viewed in the context of its limitations. It is difficult to recognize the causes for the change in chewing function among the elderly. The alterations in perception of chewing ability might occur due to age, sensory and physiological changes, disease, and drug-related processes. The study was cross-sectional in design, so the inference of causality in the associations was not possible. It was conducted on patients who reported to the institution with dental-related issues, which could have affected the results of the survey. The perception of chewing ability and OHRQoL might be different among the patients in comparison to the general population. There is a definite rise in the aging population in India, the total number and proportion of elderly persons has increased from 1900 to present. The improvement in OHRQoL among elderly individuals leads to increased tooth retention and ultimately the need to retain more occlusal supports. Retaining the maximum number of occlusal supports and maintaining them among a number of risk factors associated with old age poses a challenge for oral healthcare policy makers. This must bring attention to the unmet oral healthcare needs of older people. With the number of elderly continuing to increase, health promotion for this age group should focus on the preventing tooth loss, thus preventing loss of occlusal supports. This aspect of oral function, in view of its negative impact on quality of life, must receive urgent attention in the field of oral health promotion as well as help inform public policy for oral health care in early aging as well as older age groups. Edentulism should be acknowledged as a disease, and the consequences of edentulousness should be described to the population to increase their dental awareness. It is crucial to support oral health promotion among adults to prevent loss of existing natural occlusal contacts, as it negatively impacts their perceived chewing ability and ultimately their OHRQoL. It is clinically relevant to retain/restore occlusal contacts, as it contributes significantly to enhanced OHRQoL. Yamashita S, Sakai S, Hatch JP, Rugh JD. Relationship between oral function and occlusal support in denture wearers. J Oral Rehabil 2000;27:881-6. Inukai M, John MT, Igarashi Y, Baba K. Association between perceived chewing ability and oral health-related quality of life in partially dentate patients. Health Qual Life Outcomes 2010;8:118. Zhang Q, Witter DJ, Bronkhorst EM, Creugers NH. Chewing ability in an urban and rural population over 40 years in Shandong Province, China. Clin Oral Investig 2013;17:1425-35. Ikebe K, Matsuda K, Murai S, Maeda Y, Nokubi T. Validation of the Eichner index in relation to occlusal force and masticatory performance. Int J Prosthodont 2010;23:521-4. Ikebe K, Morii K, Matsuda K, Nokubi T. Discrepancy between satisfaction with mastication, food acceptability, and masticatory performance in older adults. Int J Prosthodont 2007;20:161-7. Joshipura KJ, Willett WC, Douglass CW. The impact of edentulousness on food and nutrient intake. J Am Dent Assoc 1996;127:459-67. Leake JL. An index of chewing ability. J Public Health Dent 1990;50:262-7. Paturu R, Thallam Veeravalli P, Vaidyanathan AK, Grover M. Evaluation of nutritional status and eating pattern in first and second-time denture wearers: A prospective 60 days (2 months) pilot study. J Indian Prosthodont Soc 2011;11:156-64. Kanno T, Carlsson GE. A review of the shortened dental arch concept focusing on the work by the Käyser/Nijmegen group. J Oral Rehabil 2006;33:850-62. Fueki K, Yoshida E, Igarashi Y. A systematic review of prosthetic restoration in patients with shortened dental arches. Jpn Dent Sci Rev 2011;47:167-74. Khan S, Musekiwa A, Chikte UM, Omar R. Differences in functional outcomes for adult patients with prosthodontically-treated and -untreated shortened dental arches: A systematic review. PLoS One 2014;9:e101143. Nguyen TC, Witter DJ, Bronkhorst EM, Gerritsen AE, Creugers NH. Chewing ability and dental functional status. Int J Prosthodont 2011;24:428-36. Dong WL, Li YC, Wang LM, Dong JQ, Jiang Y, Wang ZQ, et al. 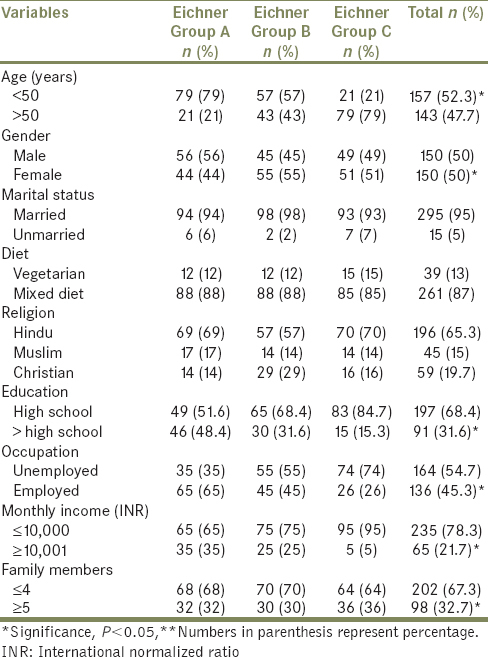 Self-rated health status among Chinese residents, China, 2010. Zhonghua Yu Fang Yi Xue Za Zhi 2013;47:1137-41. Andrade FB, Lebrão ML, Santos JL, Duarte YA, Teixeira DS. Factors related to poor self-perceived oral health among community-dwelling elderly individuals in São Paulo, Brazil. Cad Saude Publica 2012;28:1965-75. Brennan DS, Spencer AJ, Roberts-Thomson KF. Tooth loss, chewing ability and quality of life. Qual Life Res 2008;17:227-35. Kimura M, Watanabe M, Tanimoto Y, Kusabiraki T, Komiyama M, Hayashida I, et al. Occlusal support including that from artificial teeth as an indicator for health promotion among community-dwelling elderly in Japan. Geriatr Gerontol Int 2013;13:539-46. Ikebe K, Matsuda K, Morii K, Furuya-Yoshinaka M, Nokubi T, Renner RP. Association of masticatory performance with age, posterior occlusal contacts, occlusal force, and salivary flow in older adults. Int J Prosthodont 2006;19:475-81. Hatch JP, Shinkai RS, Sakai S, Rugh JD, Paunovich ED. Determinants of masticatory performance in dentate adults. Arch Oral Biol 2001;46:641-8.
van der Bilt A, Fontijn-Tekamp FA. Comparison of single and multiple sieve methods for the determination of masticatory performance. Arch Oral Biol 2004;49:193-8. Nagaraj E, Mankani N, Madalli P, Astekar D. Socioeconomic factors and complete edentulism in north Karnataka population. J Indian Prosthodont Soc 2014;14:24-8. Ettinger RL. Changing dietary patterns with changing dentition: How do people cope? Spec Care Dentist 1998;18:33-9. Gunne HS, Bergman B, Enbom L, Högström J. Masticatory efficiency of complete denture patients. A clinical examination of potential changes at the transition from old to new denture. Acta Odontol Scand 1982;40:289-97. Shinkai RS, Hatch JP, Sakai S, Mobley CC, Saunders MJ, Rugh JD. Oral function and diet quality in a community-based sample. J Dent Res 2001;80:1625-30. Bandodkar KA, Aras M. Nutrition for geriatric denture patients. J Indian Prosthodont Soc 2014;14:1-2. Ow RK, Loh T, Neo J, Khoo J. Perceived masticatory function among elderly people. J Oral Rehabil 1997;24:131-7. Pendyala G, Joshi S, Choudhary S. The ageing nation. Indian J Community Med 2014;39:3-7. Shah VR, Shah DN, Parmar CH. Prosthetic status and prosthetic need among the patients attending various dental institutes of Ahmedabad and Gandhinagar district, Gujarat. J Indian Prosthodont Soc 2012;12:161-7.